What is Berger Picard of America Rehome? The Berger Picard of America Rehome is an all volunteer service offered by the Berger Picard Club of Ameria and is funded solely by donations. To rehome, help rehabilitate if needed, and then to find these remarkable dogs who find themselves in need, a new forever home. We are also here to educate and support owners, potential adopters, and admirers of the breed, and work hard to educate ourselves so that we can confidently place adoptable dogs in the best homes possible for a happy and harmonious outcome. Who are the Berger Picard Rehome Dogs? Our rehome dogs come from a variety of places, for a variety of reasons. The foremost being those from relinquishing owners. There are unfortunately, breeders who have sold puppies into homes who were not prepared or educated about the needs of the Berger Picard, and thus those homes have been unable to meet the needs of their dog(s). It is very important then, that anyone considering a Berger Picard to do their homework! In most cases, we have found these same breeders also have usually chosen not to take any responsibility for the Berger Picard that they have bred when the owners need help or need to return the dog. A responsible breeder will always be willing to help, and if necessary, to take back a dog that he/she has bred, no matter the age or circumstance. When owners cannot get the help they need from their dog’s breeder and are in need of help in these circumstances, they contact the Berger Picard of America Rehome. If it is possible, we first try to help these families and their Picards work through and/or solve the problem(s). If that does not work, our goal then becomes to find these beautiful and remarkable dogs a new forever home. The second source of a Berger Picard in need of rehome is in a circumstance where there has been an unanticipated change in the Picard’s home and/or the owner’s life. Again, in most cases, the responsible breeder is able to be of help to these owners and their Picards, but not always. We are here to also help these Picards who find themselves in need. 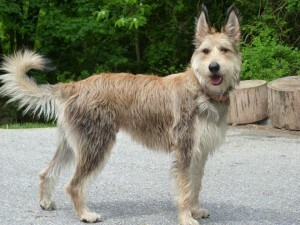 The third source of a Berger Picard in need of rehome is, unfortunately, from a Puppy Mill. Puppy Mills have occasionally produced litters of Berger Picards that were then sold to pet stores for resale at exorbitant prices. Many of the people who have a dog from such a place, did not do any prior research or speak to anyone knowledgeable about the Berger Picard breed and bought that adorable puppy having no idea what they were getting themselves into! There is no recourse or resource to turn to for help then if needed from that place of purchase. We are here for these Picards as well. Please do not ever purchase any puppy of any breed at any pet store! If you are interested in adopting a Berger Picard, please read our page, Adopting A Picard, before email. Most of the questions, and our required application can be located there. The BPCA re-home committee assists owners who no longer are able to care for their Berger Picard. We are a group of volunteers located in areas throughout the US that provide a local re-homing for your Berger Picard. We also provide an adoption policy that assures your Berger Picard will find a loving, permanent and safe home. The primary mission of the Berger Picard Club of America Re-home Committee is to support the dedicated individuals and organizations, listed in our directory (forthcoming), who rescue Berger Picards in need of a permanent home. All rescue volunteers use rescue documentation, premise and reference check adoptive homes, and spay/neuter if the Picard is of proper age and health appropriate. Many have a list of pre-approved and often Berger Picard-experienced homes waiting to adopt. Additionally, the BPCA has agreed to provide reciprocal cooperation, through our BPCA National Re-home Chair, with the Berger Picard Club of Canada in assessing homes for dogs contemplated being sent to the US. If you are looking for a rescued Berger Picard as a companion, our volunteers can be reached to discuss the possibility of a Picard joining you. Help us protect the breed by keeping rehoming ads off the internet and social media.